Download the report now to find out how to implement a digital strategy that is informed by the needs and behaviors of your customers. The needs and digital behavior of your target market is important to decipher before planning your technological investments. 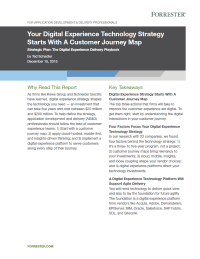 Forrester Research says vendors like Acquia, Adobe, Demandware, EPiServer, IBM, Oracle, Salesforce, SAP hybris, SDL, and Sitecore will provide a solid foundation for your company’s digital experience strategy. Application development and delivery (AD&D) professionals should perform three key actions to increase their customer experience and choose the right tools that lay the foundation for future agility.